Russian Violet Blue Cremation urn is a practical made pure brass quality metal urn decorated in double gold band. 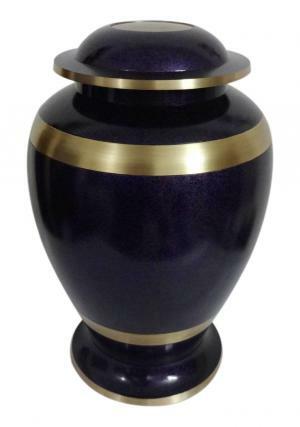 Brass metal adult urn is enamelled in violet blue with sand casting finish. Violet Blue Gold Band Brass Adult Funeral Urn has flat ended mount top lid with gold edge. The lid is decorated in screw threading to secure ashes of the loved one’s and volume space of 200 cubic inch for ashes. The large adult violet blue cremation urn has the dimensions of height 10.24 inch, width 6.7 inch and weighs 2.45 kg.